Text source: Copyright © India Missions Association - Edited by Philipose Vaidyar. Used with permission. 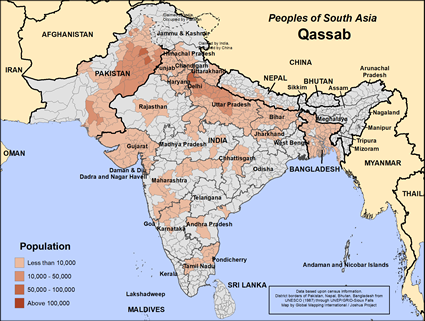 The Kasai or Qassab people are also known as Kassab, Bakar Qassab, Quresh, Gau Gowa or Guru Qussai, Shaikh, Chikwa and Gai Kassia, etc. They are found in different states of India especially in the big towns and cities. Their community name Qassab in Arabic means "to cut". They claim that their origin is from Arabia. They are a professional Muslim caste of butchers and slaughterers of animals and selling meat. Many of them are now engaged in business or work as daily-wage labours. 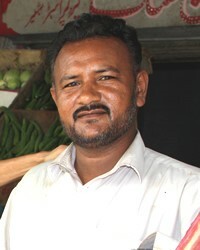 The Kasai or Qassabs speak Urdu among themselves but are equally conversant with Hindi. Though they use the Perso-Arabic script, sometimes they also use the Devanagari script. Both child and adult marriages are in practice. Group marriages are also performed at public places like the Idgah. Normally only the husband can divorce his wife, however the wife is also entitled to seek divorce through her parents. Circumcision is performed for the males. The dead are buried and a forty-day mourning day is observed. The Kasai has a council known as Jamat, which constitutes of five chosen members. All types of disputes are referred to the Jamat. They adhere to the Islamic code of conduct with regard to marriage, divorce, remarriage and the inheritance of property. Their sacred specialist is the Qazi, who performs worship and other rituals. The Kasai people belong to the Sunni sect and they profess Islam. They have faith in Nasir Pir. The Imam and Qazi impart religious teachings and perform the religious rites. Traditionally they do not accept water and food from Hindu communities. They share the burial grounds and mosques with other Muslim groups. Alternate names: Qassab, Gau Qassab, Quresh, Bakar, Gau Gowa or Guru Qussai, Shaik, Chikwa, Gai Kassia. * For the salvation of the Kasai or Qassab people and that God may send several Christian workers to work among them and meet their spiritual and physical needs. * That the practice of child marriages among the Kasai or Qassab people may come to an end. * That they would embrace changes for the better through education and developmental programmes and opportunities.View Qassab in all countries.